Bikers Against Child Abuse gives power to kids in tough circumstances. On the surface, they look tough: a dozen leather-clad bikers roaring along the street, helmets and aviator-type sunglasses obscuring their faces, bearing names like Grizzly, Colonel and Deadly. To the children they empower, however, they are heroes. 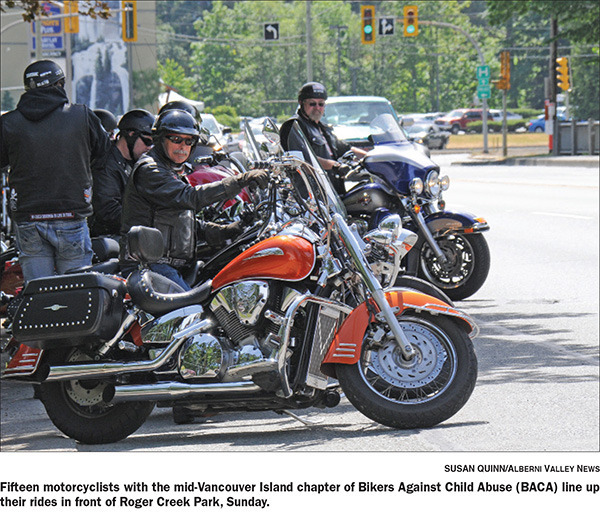 Fifteen members of the mid-Vancouver Island chapter of Bikers Against Child Abuse held a public session in Port Alberni on Sunday, visiting with children and training for the day they will have to accompany an abused child to court. BACA members are fathers, grandfathers, mothers, grandmothers, aunts, uncles. They are members of motorcycle gangs, and they are individual riders who simply want to help children. Colonel is a father, a grandfather and an uncle. He was abused in his past, he said, and got involved so he can protect other children going through similar situations. The mid-Island BACA chapter has so far only been training, although members like Colonel have accompanied other chapters on escorts. BACA is a 20-year-old non-profit organization, formed in the United States by a licensed clinical social worker who recognized there were gaps in the system when it came to protecting children and providing funding for therapy. With BACA, the child always comes first. There are specific training methods members learn for intervention, child and court liaison training. They work with government agencies to protect children going through the court system, and provide support to children and their families that other organizations cannot provide. Moreover, they “adopt” these children into their BACA family. Port Alberni RCMP Cpl. Jen Allan met a couple of chapter members last month when they came to the detachment to ask for some criminal record checks on members—every BACA member has to pass the “vulnerable sector” portion of a police record check, she said. “We certainly got a good feeling with these fellows. There’s no information they provided to us that caused us to have any concerns about their message or intentions,” Allan said. “If this is one avenue where there’s a number of ‘big brothers’ that…could impact a child in a positive manner, that’s a good thing,” she said. Above all, says Colonel, BACA is not about violence. Members who accompany children to court are non-confrontational and respectful of all law enforcement personnel and rules, he said. “There’s a video on YouTube of a motorcycle gang chasing a guy down and beating him up. That’s not us.